Great success - Year 13 students collecting their results in August 2018. 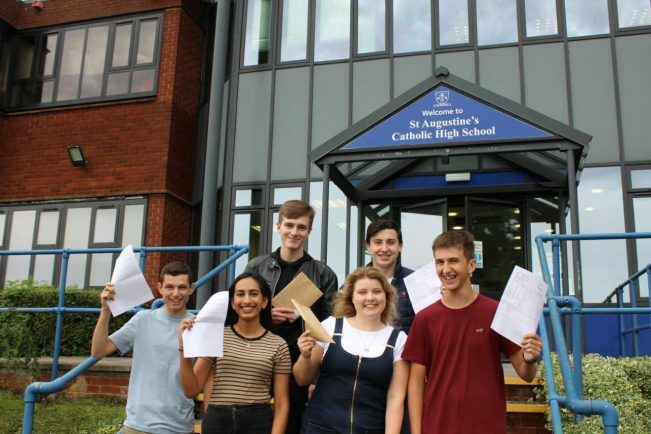 STAFF and pupils at St Augustine’s Catholic High School in Redditch are celebrating a wave of success. The school has been listed 18th in the country overall, the top mixed Catholic school nationally for the progress of its pupils and also 8th in the country for girls progress. Year 11 students finished last year with an average progress score of 1.21 which is higher than the national average and places the school firmly in the country’s top 1%. Headteacher Gerald O’Connor, said: “I am delighted by the extremely positive results achieved by the students of our school. “Although I am not surprised because we strive to raise aspirations, develop independence and foster a love of learning. Redditch MP Rachel Maclean also congratulated the school for its outstanding work. She said: “Well done to all the staff and pupils at St Augustine’s on another set of excellent results.